Follow the trail of the Knights of Templar. Portugal owns many more surviving sites related to this enigmatic order than any other country in Europe. Having arrived in Portugal in the time of Countess Teresa, the mother of Portugal’s first king, Afonso Henriques, the Knights of Templar were present at many of the landmark moments in the history of Portugal with significant role in the nations foundation. After the persecution of the order, its members survived as a new order, in the name of The Order of Christ and under the protection of Portuguese kings have taken a major role in the development of the nation culminating in the Age of Maritime Discoveries. The order’s cross today remains the symbol of the Portuguese Navy and Air Force. We will visit castles, convents, battle fields at the north of Portugal reliving past events learning of the order’s importance and achievements. Most of the sites on the tour belong to the UNESCO World Heritage protection and are recognized for their immense historical and artistic significance. Day 1: Lisboa | Almourol | Tomar. 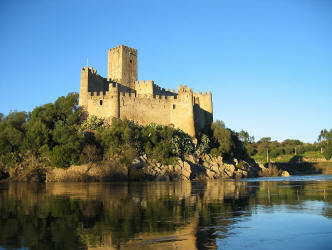 This morning we depart to legendary Almourul castel to the north of Lisbon located on an island of the Tagus river. The area was one of the strongholds of ancient Lusitanian warriors then the occupying Moorish caliphate built an impressive castle. After the recon quest of Christians in the 12th century the castle was bestowed to the Knights of Templar by the Portuguese king in exchange for protecting the area north of Lisbon. Continue on to the town of Tomar, the order's historical head quarter to visit the Castle and Convent of Tomar. This is undoubtedly one of the finest architectonic works existing in Portugal. We will see the castle with its imposing bulwark, the Charola — considered the best preserved Templar church with a centralized layout as well as the enigmatic Manueline lace like window and the main cloister, a masterpiece of the European Renaissance. We then gain the opportunity to visit the Church of St. John the Baptist, the main church of Tomar, with its original structure based on the orders of King Manuel, a former governor of the Order. We then move onto the Church of Santa Maria dos Olivais. This fine example of Gothic architecture served both as the pantheon for the grand masters of the Order and a template for churches built throughout the Portuguese empire. Accommodation in Tomar. We first set off for the pretty setting of Dornes, located alongside the river Tagus. Here, we tour the Templar Tower, also known as the Tower of Dornes. We then follow this with a visit to the interpretation center on the famouse Battle of Aljubarrota that takes you back to 1385. Take a look at the famouse battle scene that determined once and for all Portugal's independence from expanding Spanish power and establish borders. Lopo Dias de Sousa, a canonical religious master in the Order of Christ, proved a defining and fundamental figure in this period of history. To celebrate the decisive victory King John I of Portugal order ed the constrcution of one of Europe's most important gothic monasteries of Europe at Alcobaca, a protected UNESCO World Heritage site. Drive to the Monastery with its church containing one of the largest Cistercian abbeys in Europe. This architectural masterpiece was built under the supervision of Saint Bernardo de Claraval, principal abbot in the Cistercian order and a great mentor and driver in the Order of the Knights Templar. We then depart in the direction of Sintra a charming town and a UNESCO World Heritage place. 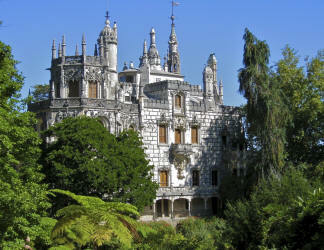 Accommodation in Sintra. Today we begin the day with a visit to Quinta da Regaleira, a fairy tale palace and gardens a leading example of the Romantic architectural style and one of the most esoteric and mysterious places in Portugal. We reveal a few of the secrets of these enchanting surroundings replete with neo-Templar symbols such as the initiation well. We then take in the Tower of Belém, the Portuguese monument that symbolizes the era of the Great World Discoveries and the National Navy Museum where we will have a chance to see into, with the help of two of the governors of the Order of Christ, Prince Henry the Navigator and King Manuel, what was certainly the most splendid period in the history of Portugal that, as the Poet himself affirmed, gave new worlds to the World. End of our services. Extra nights in Lisbon and other tours in Portugal tours can be added. Tour departs 9am from terminal Marques de Pombal in Lisbon or free pick up from Lisbon hotels.